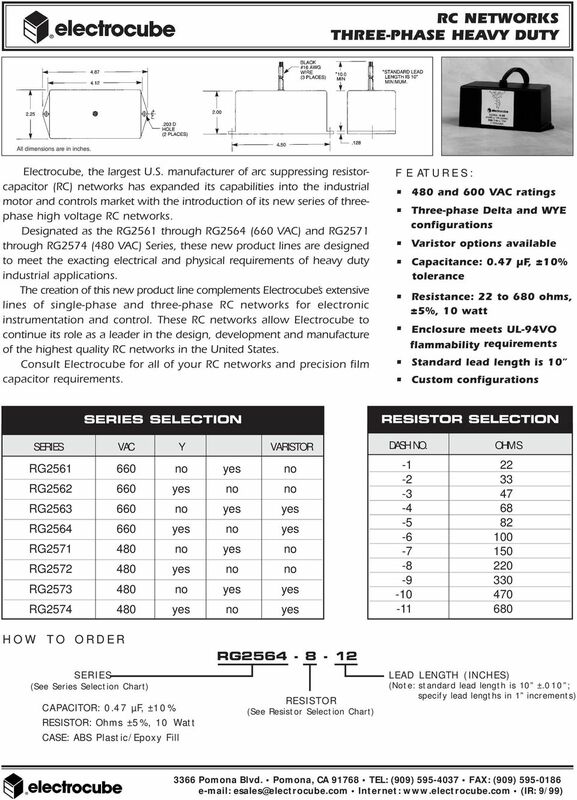 Download "RC NETWORKS SALES GUIDE"
1 SALES GUIDE INTRODUCTION TO Recent developments in electronic equipment have shown the following trends: Increasing demands for numerical control machines, robotics and technically advanced appliances are requiring progressive electronic technologies. When employing integrated circuit and microcomputer technology, today s equipment is required to perform multifunctions in limited size. The denser the installation of components, the more the components must be miniaturized and of lighter weight. As a result, the following problems arise: Functional limits of magnetic relays and switches have narrowed due to increasing contact amperage. Miniaturization of electronic components has reduced their dielectric strength. Circuit noise has increased as a result of the coexistence of signal and power lines. Safety standards for electronic equipment and components have become increasingly restrictive. Some key factors affecting circuit performance are: Arcing between relay and switch contacts cause pitting and whiskers resulting in premature contact failure. 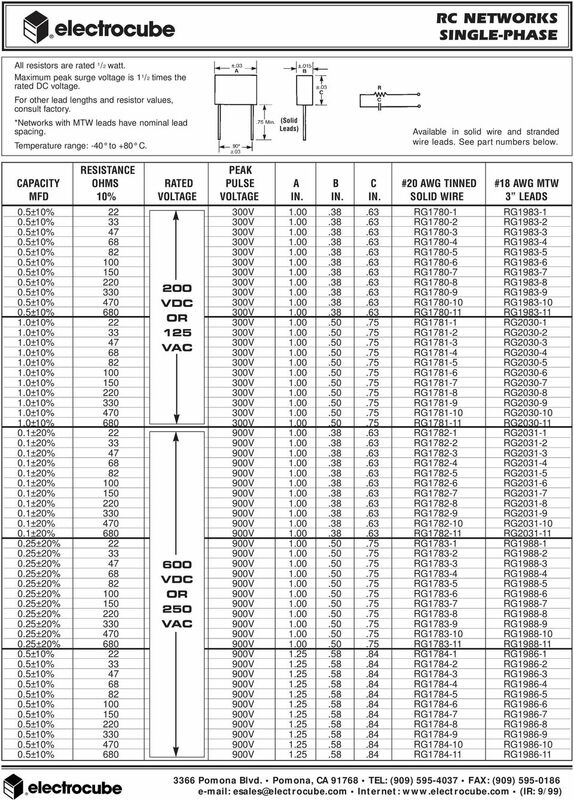 Contact arcing results in high frequency noise and abnormal high voltages. The generation of back electromotive force (EMF) is due to the inductance of loads present. The occurrence of high frequency noise is the result of contact chatter in magnetic relays and switches. Back EMF, due to inductance, affects Silicon Control Rectifiers (SCRs) and Solid-State Relays (SSRs) and can result in the breakdown of other semiconductor devices. Power line surges must also be carefully considered. Either may be a contributing factor in equipment malfunctions, failures and in extreme cases of fire and/or electrical shock. To illustrate these factors, consider that relay contact chatter is capable of inducing oscillations of several KHz, contact arcing frequencies of several MHz and amplitudes 10 to 20 times normal circuit voltages. Voltage surges from external sources may approach thousands of volts. To protect electronic equipment against costly failures or malfunctions, Electrocube has developed advanced components to suppress contact arcing and filter unwanted electrical noise. GENERAL CONSTRUCTION RC Networks are easily selectable electronic components designed to prevent or substantially minimize the occurrence of arcing and noise generation in relay and switch contacts. RC Networks consist of specially designed capacitors and resistors connected in series. Spark discharges and induced noise are absorbed over a wide range by the accumulation characteristic and impedance of the capacitor, while the RC time constant delays and averages surge voltage and oscillations. RC Networks must have the capacity to store surge voltages and current energy and afford protection against inductively induced potentials. The dielectric material of Electrocube s capacitors, used in RC Networks, affords a very high degree of voltage withstand strength. All resistors are non-inductive types to insure a high degree of protection against pulse potentials. 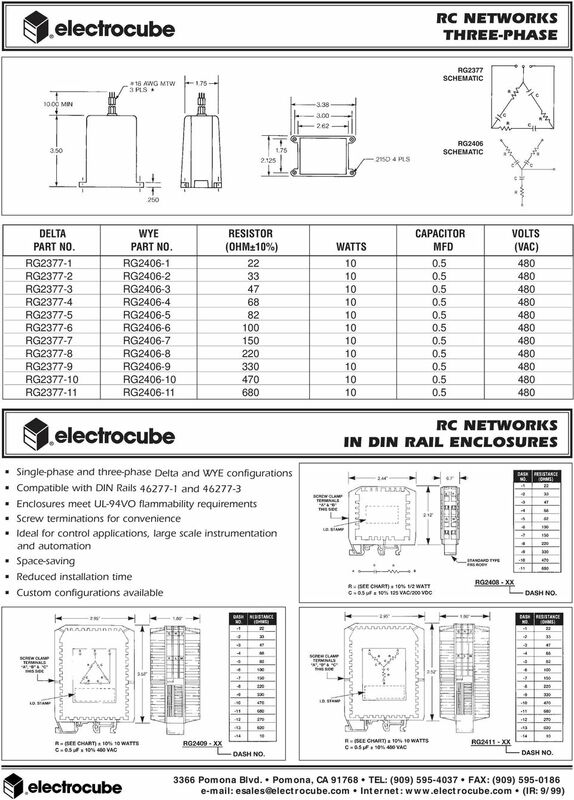 To provide additional protection for equipment and users, especially when these components are used in their applications, all Electrocube RC Networks are packaged in cases which meet or exceed the flammability requirements of UL94VO. 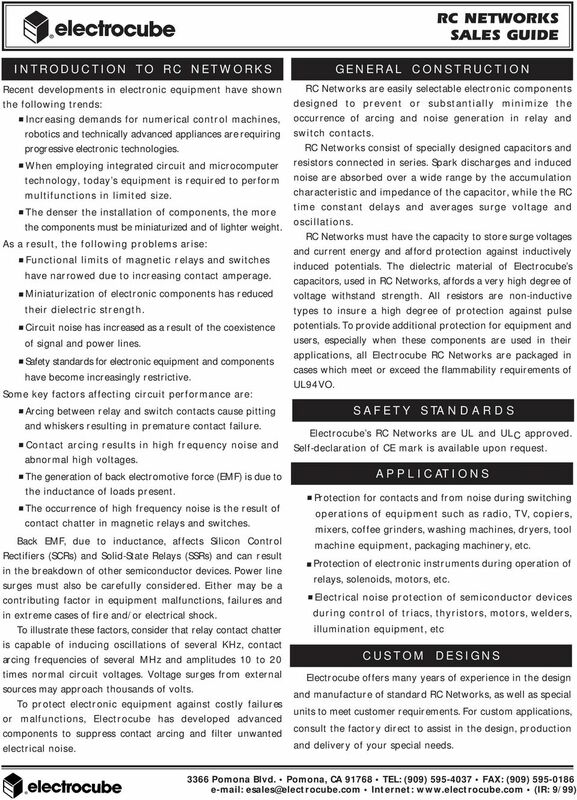 SAFETY STANDARDS Electrocube s RC Networks are UL and ULC approved. Self-declaration of CE mark is available upon request. APPLICATIONS Protection for contacts and from noise during switching operations of equipment such as radio, TV, copiers, mixers, coffee grinders, washing machines, dryers, tool machine equipment, packaging machinery, etc. Protection of electronic instruments during operation of relays, solenoids, motors, etc. Electrical noise protection of semiconductor devices during control of triacs, thyristors, motors, welders, illumination equipment, etc CUSTOM DESIGNS Electrocube offers many years of experience in the design and manufacture of standard RC Networks, as well as special units to meet customer requirements. For custom applications, consult the factory direct to assist in the design, production and delivery of your special needs. 2 ENGINEERING GUIDE EFFECT OF APPLICATION EXAMPLES ARC SUPPRESSION At the moment of switch opening, the RC combination absorbs and suppresses the energy of the arc by letting it bypass the switch. 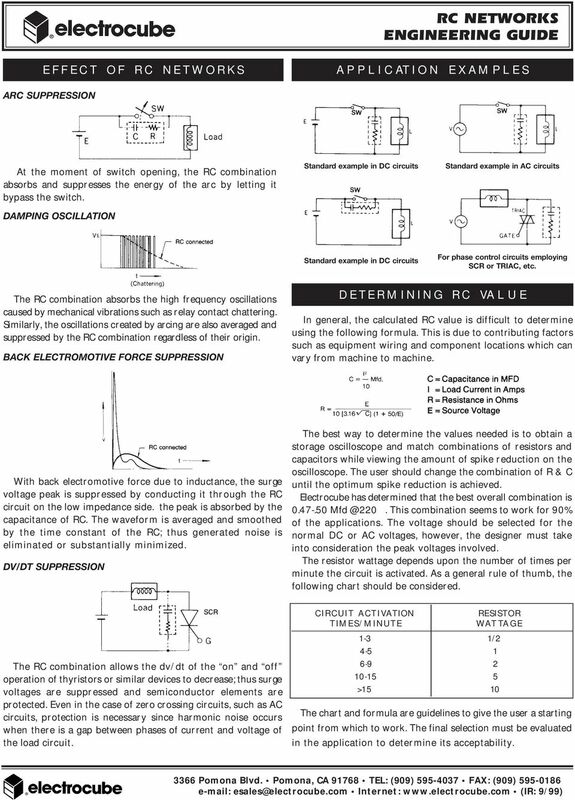 DAMPING OSCILLATION Standard example in DC circuits Standard example in AC circuits Standard example in DC circuits For phase control circuits employing SCR or TRIAC, etc. The RC combination absorbs the high frequency oscillations caused by mechanical vibrations such as relay contact chattering. Similarly, the oscillations created by arcing are also averaged and suppressed by the RC combination regardless of their origin. BACK ELECTROMOTIVE FORCE SUPPRESSION DETERMINING RC VALUE In general, the calculated RC value is difficult to determine using the following formula. This is due to contributing factors such as equipment wiring and component locations which can vary from machine to machine. E With back electromotive force due to inductance, the surge voltage peak is suppressed by conducting it through the RC circuit on the low impedance side. the peak is absorbed by the capacitance of RC. The waveform is averaged and smoothed by the time constant of the RC; thus generated noise is eliminated or substantially minimized. DV/DT SUPPRESSION The best way to determine the values needed is to obtain a storage oscilloscope and match combinations of resistors and capacitors while viewing the amount of spike reduction on the oscilloscope. The user should change the combination of R & C until the optimum spike reduction is achieved. Electrocube has determined that the best overall combination is W. This combination seems to work for 90% of the applications. 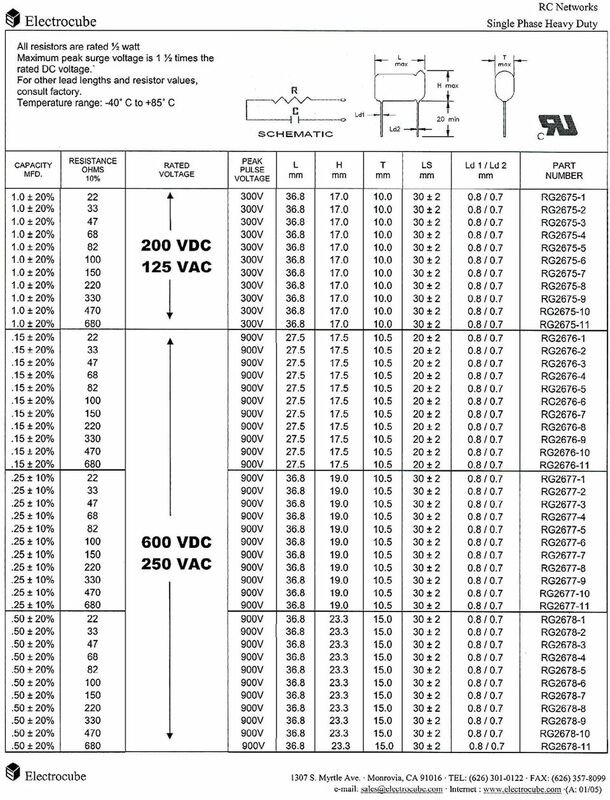 The voltage should be selected for the normal DC or AC voltages, however, the designer must take into consideration the peak voltages involved. The resistor wattage depends upon the number of times per minute the circuit is activated. As a general rule of thumb, the following chart should be considered. The RC combination allows the dv/dt of the on and off operation of thyristors or similar devices to decrease; thus surge voltages are suppressed and semiconductor elements are protected. Even in the case of zero crossing circuits, such as AC circuits, protection is necessary since harmonic noise occurs when there is a gap between phases of current and voltage of the load circuit. 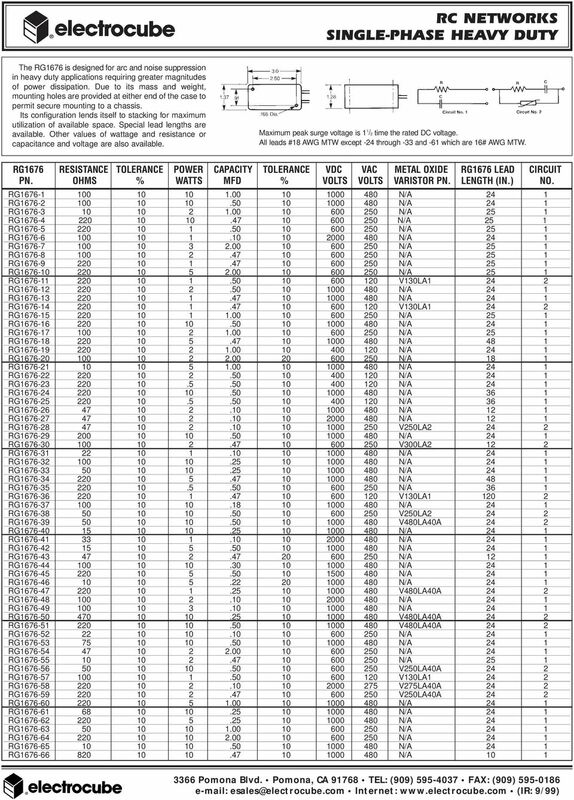 CIRCUIT ACTIVATION RESISTOR TIMES/MINUTE WATTAGE 1-3 1/ >15 10 The chart and formula are guidelines to give the user a starting point from which to work. The final selection must be evaluated in the application to determine its acceptability. pero 1 Three Phase Solid State Relays & Their Application in Three Phase Heating Circuits By Paul Bachman, Fellow Engineer, Dr. Oscar Montero, R&D Manager, and Doug Sherman, FSAE Manager, Crydom, Inc.
Instruction Manual BEFORE USING THE POWER SUPPLY UNIT Pay attention to all warnings and cautions before using the unit. Incorrect usage could lead to an electrical shock, damage to the unit or a fire hazard. Troubleshooting accelerometer installations Accelerometer based monitoring systems can be tested to verify proper installation and operation. Testing ensures data integrity and can identify most problems. CAUTION! A high-quality capacitor can hold a charge for long periods of time.